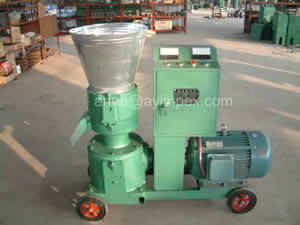 The granulator can produce pellet from sawdust and other kinds of material. With the fast development of Wood Pellets industry, Wood Pellet Press becomes very popular in the world. It has the advantage of low price, low consumption, high capacity; etc.It is a good choice for small farm family. And it is one kind of energy source machines which can process wood sawdust, wood lump, etc agro-waste resource. Our Flat Die Pellet Press can process wood sawdust, straw, different kinds of stalks, grass, etc.The best moisture content for pelletizing is between 13%-15%.